President Bush's plan to send more troops to Iraq ran into a wall of criticism on Capitol Hill on Thursday as administration officials drew confrontational and sometimes mocking challenges from both Democrats and Republicans. Defense Secretary Robert Gates said in response that the administration might abandon the increase if the Iraqi government doesn't do its part, but he provided no timetable. "I think most of us, in our minds, are thinking of it as a matter of months, not 18 months or two years," he told the House Armed Services Committee. Bush and top members of his national security team sought to rally support for the troop buildup a day after he unveiled his plan for turning around a conflict that has lasted nearly four years and cost the lives of more than 3,000 American military personnel. Instead, Gates and Secretary of State Condoleezza Rice found themselves embroiled in the first pitched exchanges in a battle that is likely to dominate Congress for months or longer and is already shaping the 2008 presidential election. "I think this speech given last night by this president represents the most dangerous foreign policy blunder in this country since Vietnam, if it's carried out," Sen. Chuck Hagel, R-Neb., a potential 2008 presidential contender, told Rice. As many as a dozen Republican senators could jump ship on the plan, reports CBS News correspondent Gloria Borger. As for the Democrats, their "no's" were nearly unanimous. "Why should we give you the benefit of the doubt this time, when it appears so evident that so many mistakes have been made in the past?" said Rep. Robert Wexler, D-Fla.
His colleague, Sen. Bill Nelson, D-Fla., noted his own past support for the administration on the war but said he could not continue. He declared, "I have not been told the truth over and over again by administration witnesses, and the American people have not been told the truth." Americans' opinions apparently were not swayed very much by President Bush's speech outlining his new strategy, according to a poll. Fifty percent of those who saw the speech said they disapprove of the president's proposals, while 37 percent said they approve. Just one-third of those surveyed said they support Mr. Bush's call to send more than 20,000 additional troops to Iraq. Following the speech, 68 percent of Americans — the same number as prior to the speech — said they were uneasy about the president's ability to make decisions about Iraq. Bush, visiting with troops at Fort Benning, Ga., cautioned that the troop increase "is not going to yield immediate results. It's going to take a while." "American patience is limited, and obviously if the Iraqis fail to maintain their commitments we'll have to revisit our strategy," said Gates. At one point Gates, just three weeks on the job, told lawmakers, "I would confess I'm no expert on Iraq." Later, asked about reaching the right balance between American and Iraqi forces, he told the panel he was "no expert on military matters." Committee members pressed Gates, who replaced Donald Rumsfeld at the Pentagon, on an exit strategy for the United States. "At the outset of the strategy, it's a mistake to talk about an exit strategy," he said. Gates, in testimony to the committee and earlier at a news conference, said he was requesting increasing the size of the Army and Marine Corps by 92,000 troops over the next five years. He also said the Pentagon would recall to duty sooner than planned some National Guard and Reserve troops who have served yearlong tours in Iraq or Afghanistan. As Rice testified to the House Foreign Affairs Committee, Rep. Howard Berman, D-Calif., likened Bush's plan to a "Hail Maliki pass" — jokingly combining Iraqi Prime Minister Nouri al-Maliki's name with the football "Hail Mary" desperation pass. The U.S. led a coalition that invaded Iraq in March 2003, despite failing to win U.N. Security Council support. The government of Saddam Hussein quickly crumbled and Bush declared major combat operations over two months later. Bush's war effort initially had strong support, both in Congress and among other Americans. Yet that support has eroded as violence has continued. Senate Majority Leader Harry Reid, D-Nev., said he hoped to bring up a nonbinding resolution next week expressing opposition to any troop buildup. A similar move is expected in the House. Reid, in a Senate speech, said Bush ignored the results of November's midterm elections that ended 12 years of GOP control of Congress, the advice of the bipartisan Iraq Study Group and that of his own top generals. "In choosing to escalate the war, the president virtually stands alone," Reid said. The Senate's top Republican, Mitch McConnell of Kentucky, threatened a filibuster — a delaying tactic — to block any legislation expressing disapproval of the buildup plan. McConnell conceded that GOP lawmakers as well as Democrats are troubled by Bush's new policy, but he said, "Congress is completely incapable of dictating the tactics of the war." Options for critics of the war to try forcing its end are limited, given the slim margin of Democratic control, especially in the Senate. But votes stating symbolic opposition to the troop buildup could embarrass many Republicans leery of supporting Bush's plan. Rice appeared in the morning before the Senate Foreign Relations Committee and in the afternoon before the House counterpart. She was grilled sharply by members of both parties. Not a single member of the Senate panel expressed outright support for the president's plan. One after another offered skepticism on various points — from the rationale for the war to al-Maliki's sincerity and resolve, from the need for additional troops to the administration's ruling out talking to Iran and Syria. "You're going to have to do a much better job" explaining the rationale for the war, "and so is the president," said Sen. George Voinovich, R-Ohio. He said Mr. Bush could no longer count on his support for the war. 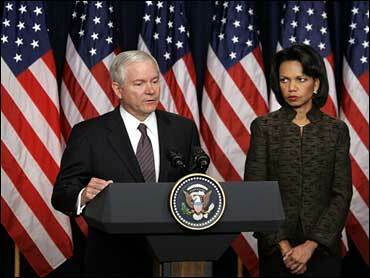 Rice acknowledged widespread skepticism among Americans. "I want you to know that I understand and indeed feel the heartbreak that Americans feel at the continued sacrifice of American lives," she said. Rice engaged several tense exchanges with members, including with Hagel, a Vietnam veteran and longtime critic of Bush's Iraq policy. She disputed his characterization of Bush's buildup as an "escalation." "Putting in 22,000 more troops is not an escalation?" Hagel asked. Responded Rice: "I think, senator, escalation is not just a matter of how many numbers you put in." "Would you call it a decrease?" Hagel asked. "I would call it, senator, an augmentation that allows the Iraqis to deal with this very serious problem that they have in Baghdad," she said. When Rice disputed Hagel's contention that Iraq was in the throes of civil war, Hagel shot back: "To sit there and say that, that's just not true." Said Committee Chairman Joe Biden of Delaware: "I believe the president's strategy is not a solution, Secretary Rice. I believe it's a tragic mistake." Rice told senators there was a "national imperative not to fail." The Senate panel was flush with 2008 presidential hopefuls and possible contenders, including Hagel, Biden and Democrats John Kerry of Massachusetts, Christopher Dodd of Connecticut and Barack Obama of Illinois. Meanwhile, Sen. John McCain, R-Ariz., another presidential hopeful, said after a meeting at the White House that he was concerned about al-Maliki's capabilities as well as "whether these are sufficient number of troops." But, he said, "I do think we can succeed." McCain is among a handful of lawmakers who have called for more — not fewer — U.S. troops in Iraq.